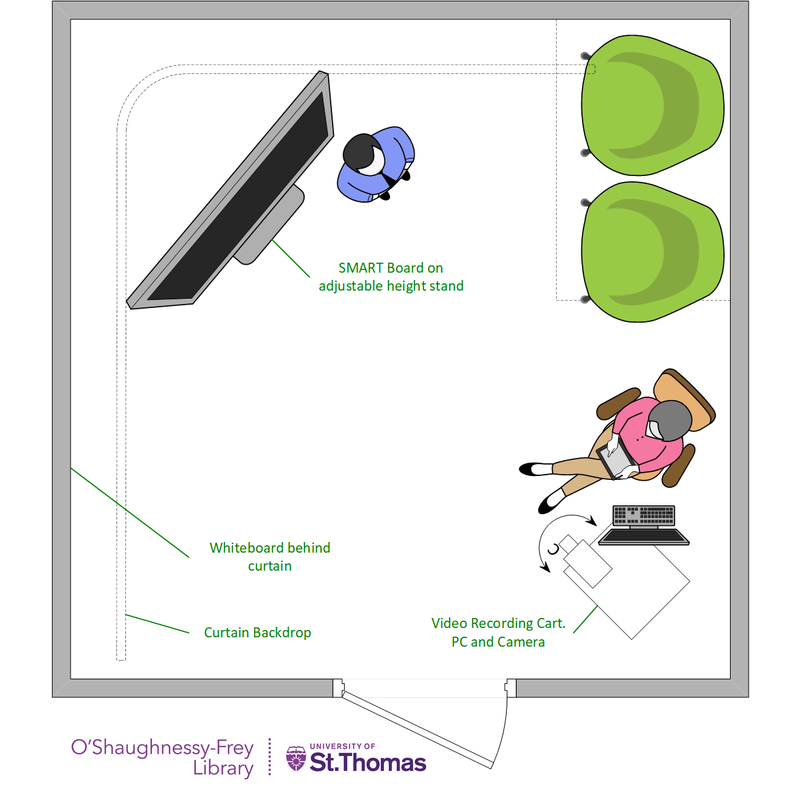 O'Shaughnessy-Frey Library Room 310 is a self service video recording studio for student use. Dedicated to students, it is available during normal library hours until 2am most days! The space is flexible with a height adjustable SMART Board, furniture, lighting, sound, etc., to give your video presentation or group discussion the perfect, distraction-free setting. Bring your own camera or smart phone, or use the one provided in the room. Use of this room by individuals or groups is by reservation for video recording purposes only. Reserving the studio is easy and immediate. Just choose an available time slot and confirm by logging into the room reservation system. Your reservation will be approved and ready instantly. NOTE: The room is locked so stop by the circulation desk on 1st floor of O'Shaughnessy-Frey Library to check out the room key. You will need your St. Thomas ID card. While great care has been taken to wrap the cables and keep the space tidy, it is important to note that this is an active studio. Please be aware of tripping hazards and your own ability to move items. If you need assistance, please contact the library tech help by calling 651-962-5002. If you have your own cables to run across the floor please use the black, rubber cable covers provided. Do not roll equipment over cables or store items in an unsafe manner. 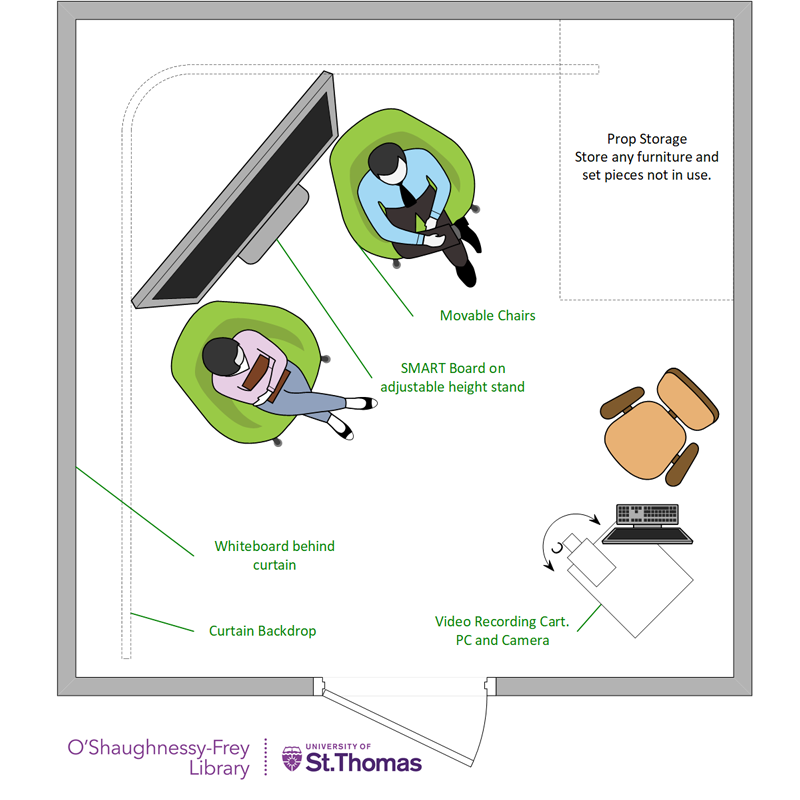 The O'Shaughnessy-Frey Library is providing a self-service recording space, not a full production/editing space or service. Students should be able to reserve, set-up, record, and save their work on their own. The space only provides recording capabilities and not video editing. Library technical staff is not available to assist in recording or editing. Before students show up to the studio they should already be familiar with the software, device, and/or cloud service they are using to record and store the video. If technical needs arise, for example something is not working, connected properly, or broken or damaged, students using the room may contact library technical staff at 651-962-5002. The technical staff is available during all open hours and may be able to walk you through troubleshooting over the phone or by stopping by the room. This is just an overview of the features in the recording studio. For detailed information on using the devices in the room please refer to the technical sections below. The furniture, SMART Board, and video cart in the space is movable for the creation of various styles of sets. Please be careful when moving and adjusting items. Please do not disconnect any cables. The SMART Board is on a roll-away, motorized, height adjustable stand. You can adjust the height to suit your needs whether you are doing a stand-up presentation or using it as a backdrop video screen behind a sit down, interview, conversational production. If your production does not require the use of the SMART Board you may roll it off to the side out of frame. Note: The SMART Board is heavy and may require two individuals to move. There are handles on the back, near the center of the board. Please be careful not to trip or roll over the cables. The furniture in the space is movable. You may choose to have a stand-up presentation with no furniture, or set-up a sit-down interview or discussion style presentation. Please be gentle with the furniture when moving and storing. When done with the studio please return furniture and equipment to the locations marked on the floor. The camera in the studio is connected to a PC running Windows 10. You can use VLC to record locally and save to your own USB drive or cloud account, Panopto to record to the cloud for assignments, or Zoom and Skype to live stream. The camera also has pan and zoom capabilities via a remote. The recording cabinet has a camera and microphone already mounted and connected to a PC for recording. However, you may choose to use your own phone to record by using the phone mount swing arm on the front. You can also turn the cabinet around to place a laptop on top and use your laptop's built in webcam. The SMART Board is ready to provide a drawing surface, a large, touch enabled computer screen, or display your own laptop or device. Touch the black bar at the bottom of the screen to bring up a menu to switch between inputs and modes. * (one dot) Lowest - Ideal for using as a backdrop behind seated presenters. ** (two dots) Medium - Ideal for using as a viewing screen while presenters are seated. *** (three dots) Highest - Ideal for stand-up presentations. Controls (top to bottom) Power/Sleep, Volume Up, Volume Down, Pause. Input Ports (top to bottom): USB and HDMI. Clean Up - wipes the Whiteboard mode clean. Change Mode/Input Bar: Touch the black bar along the bottom frame to access the mode panel (currently displayed in example image). Choose between apps (such as Whiteboard), Input, or Screen Share. Input Selection: Display Port (in-room computer) or HDMI 1 (your own laptop or device). Cables to connect your device are on the left side of the board in the back. Back and Share Whiteboard from device. The SMART Board’s display will go to sleep after a period of inactivity. There is a power button on the right side of the display panel. To change inputs on the SMART Board, touch the black bar at the bottom of the screen just above the pen and eraser tray. That will bring up the various inputs and apps. You can choose Whiteboard for a drawing surface, or input for a computer. To use the SMART Board as a Whiteboard touch the black bar at the bottom of the screen and choose Whiteboard from the Mode Panel that comes up. To use the Windows 10 desktop, touch the black bar at the bottom of the screen and choose Display Port from the Favorites column. If Display Port is not listed, choose input and then Display Port. There is an HDMI cable with adapters hanging behind the SMART Board on the left side. If you need an additional adapter you may check one out from Circulation on 1st Floor. After your laptop or device is connected, touch the black bar at the bottom of the screen, choose INPUT, and then HDMI 1. Zoom and pan using the square remote. Adjust angle using mounting pole. The built in microphone picks up audio in the room well. Check levels in your recording software. Make sure it is not on mute! Use the swing arm to attach your own phone. Use your laptop's built-in webcam by placing the laptop on top of the cart. The PC has shortcuts on the desktop after you log in to some of the most popular recording options. The PC may be operated remotely by using the wireless keyboard/touch pad to start and stop video capture or advance through prepared notes. The monitor is on a swing arm so you may turn it towards the studio set to view the video feed while you are recording or to display notes. There are four options for saving or sharing your video feed. VLC and Panopto can be used to save your recording locally, and Panopto has a cloud option. Zoom and Skype can be used to present a live feed in a video conference-type format. See below for options and decide on the method that best suits your needs. VLC is able to record video locally to the computer. Be sure to save the file off to a USB drive or your personal One Drive account. All students have access to record and save video directly to Panopto. Panopto allows for minor trimming in the browser as well as the ability to download the video file for advanced editing at a later time from any computer. Students may present a live feed to other remote participants via Zoom. This is similar to the video conferencing capabilities of other group study rooms in the library with the difference of having a screen located behind the speaker in presentation style. With the chairs it can also give a more casual, rather than a board room conference, feel to your video. Similar capabilities and advantages as Zoom, except all students have a Zoom account automatically through St. Thomas. With only you and the SMART Board in frame, give a presentation while standing. 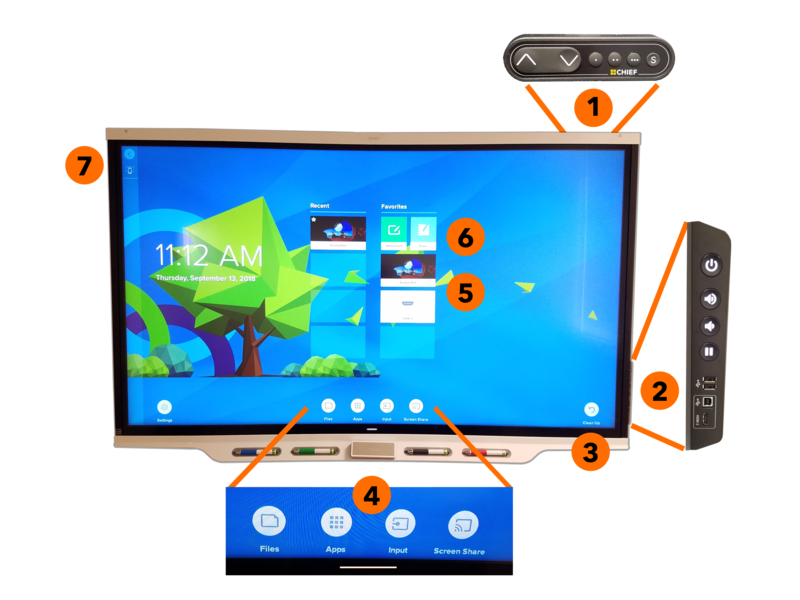 Ideal for one or more students giving a presentation which includes visuals, presentation deck, or interacting with the SMART Board in white board mode. Raise the SMART Board to it's maximum height, and then use the up and down arrow to fine tune the height so you don't have to reach or bend as you interact with the board on video. Note: If you want to use a traditional white board, there is one on the wall behind the curtain. Just move the curtain out of the way and reposition the camera. For a one-on-one or group discussion while showing visuals such as a video clip, presentation, or images from a PC or other device. (Not ideal for interacting with the SMART Board). Bring a few chairs into frame. You may bring the SMART Board to the medium height so it hangs just above the back of the chairs. 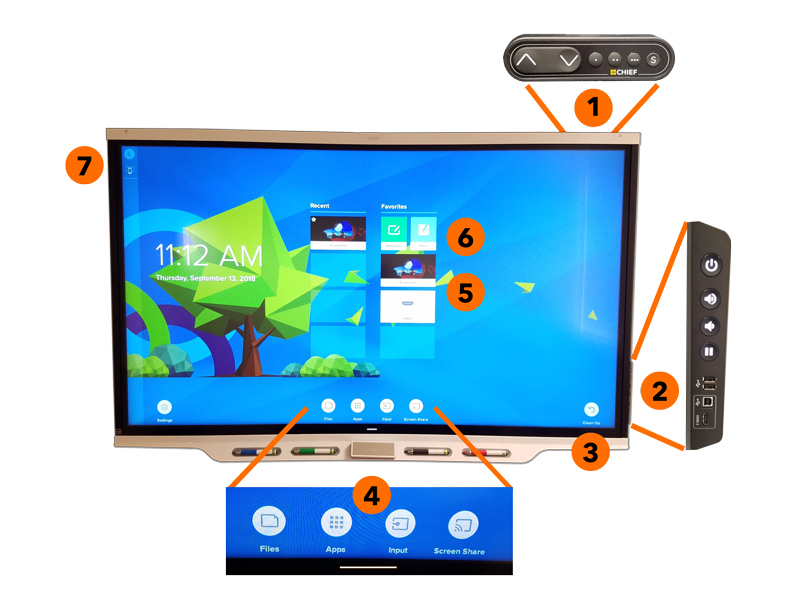 Use the SMART Board to display a logo, video clip, or as a presentation screen behind the speakers. Use the wireless keyboard and mouse for the SMART Board PC to advance slides, start and stop video clips, etc.